This is a bit complicated and yet snap-crazy brilliant. Take one part augmented reality — the ability to overlay digital views of the world on reality, such as by using a GPS-enabled iPhone that gives you graphics on a screen based on your specific location. 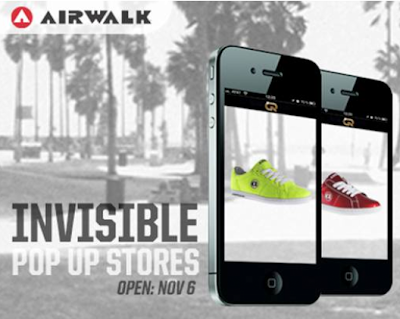 Add a second part pop-up store — a retail location that only exists for a brief period of time. Now, take away any bricks and mortar from the store. Result: A virtual retail ghost that doesn’t exist, but one you can visit if you point your smartphones at air at the right location at exactly the right time. We’re not sure if this William Gibsonesque fake-reality will ever take off, but Airwalk is getting buzz for its reissued 1990s JIM shoes by building virtual pop-up stores in New York and California. Since you have to be in-the-know to find the invisible location, the buzz around this marketing is almost a secret.